In this paper we consider how subjectivity affects the problem of scanning spectrum bands, and the impact on both the scanner and invader’s strategy. 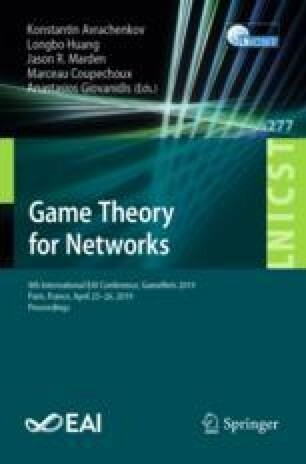 To model such subjective behavior, we formulate a prospect theoretical (PT) extension of the Bayesian bandwidth scanning game where the Scanner knows only a priori probabilities about what type of intrusion (e.g. regular intensity or low intensity) occurs in the spectrum bands. Existence and uniqueness of the PT Bayesian equilibrium is proven. Moreover, these PT Bayesian equilibrium strategies are derived in closed form as functions of the detection probabilities associated with different invader types. Waterfilling equations are derived, which allows one to determine these detection probabilities. Bands where the Invader’s strategies have band-sharing form are identified. The sensitivity of the strategies to the subjective factors and a priori probabilities are numerically illustrated.